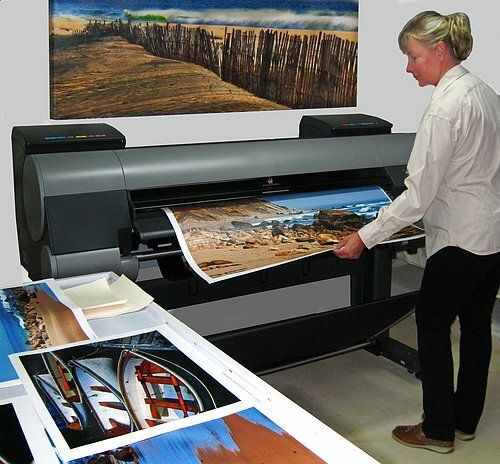 Lisa Masson Studio & Fine Art Gallery, located at 511 4th Street in Eastport, is a boutique custom large format printer. With a perfectionist’s and artist’s eye, Lisa’s experience and passion will ensure the color balance and quality you want to showcase your work. She takes pride in the high quality of her custom digitally printed banners, signage, posters, yacht plans, architectural drawings, and archival museum quality prints. Printing is available on photo paper, fine art papers, canvas, and outdoor vinyl on rolls up to 44" wide. Lisa prints your artwork using a state-of-the-art large-format printer with twelve colors of archival pigmented inks that resist fading and last longer (up to 200 years) than any other ink available. The result is a richer denser color with astounding vibrancy and resolution. Giclée (zhee-klay) "Giclée print" connotes an elevation in printmaking technology. Images are generated from high resolution digital files and printed with archival quality inks onto various substrates including canvas, fine art, and photo-base paper. The Giclée printing process provides better color accuracy than other means of reproduction. The quality of the Giclée print rivals traditional silver-halide and gelatin printing processes and is commonly found in museums, art galleries, and photographic galleries. Giclée refers to both a category of collectible fine art, as well as a type of digitally created fine art print. Not any digital print is a Giclée. Only digital prints that are created using special high-resolution printers, archival inks, media and strict printmaking standards can be truly marketed as Giclée prints. These fine art reproductions are laboratory rated to provide several decades, if not a century or more of lasting print quality. Museums throughout the world including the Louvre use Giclée prints to substitute works of art too fragile to be exhibited to the public. New York's Metropolitan Museum, the Guggenheim and the National Museum of Mexico all proudly display Giclées as part of their collections. Please visit the Lisa Masson Studio Gallery at 511 Fourth Street in Eastport to see the wide variety of custom frames and mats that are available.